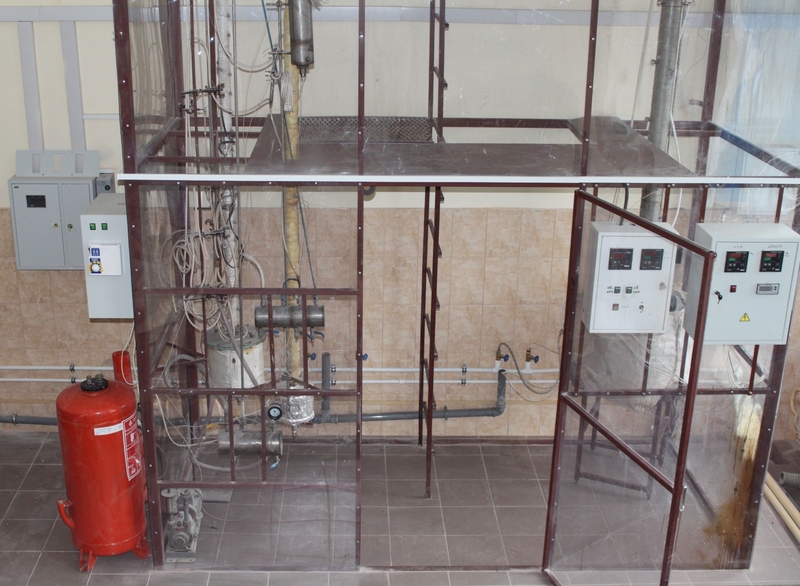 EPC “Ingehim” (EPC “Inzhekhim”, as in some older unofficial documents and affiliations in scientific publications of our employees) conducts experimental studies of distillation in real environments using our own in-house experimental units. The two units having height of 3 m represent columns of diameter 50 mm and 100 mm, respectively. The studies can be carried out either at atmospheric pressure or at vacuum and at temperatures up to 300 degrees Celcius. All works are carried out by technicians having extensive hands-on experience, who are guided by engineers holding Ph.D. or D.Sc. degrees. The Customer receives a technical report upon completion of the works. In case you are interested, please, send us a complete description of the experiments via e-mail, so that our specialists can estimate the cost and time schedule of works. Schematic of the experimental distillation unit is depicted in Fig. 2. The unit is made up of the column’s bottom 1, distillation column 2 with packing 3, vessel of head fractions 4, helical reflux condenser 5. All the elements of the unit are made of stainless steel and mounted on the metal frame right under the ventilation hood. Extraction of distillate is carried out from vessel of head fractions 4 into receiver tank 6. The extracted distillate is preliminarily cooled in cooler 7 and the amount of extracted distillated is made adjustible by means of valve 8. 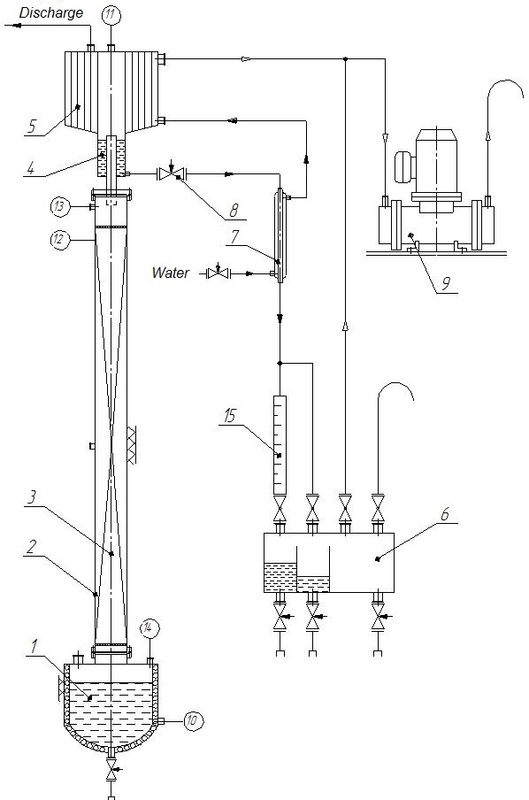 Reflux condenser is loosely connected to membrane vacuum pump 9 of type НВМ-12XD, which produces vacuum pressure up to 5 mm Hg. The column’s bottom is equipped with a heating coil whose power is made adjustable to specific needs. In addition, the column’s bottom also contains a filling tube and a drain tube. As to the packing, many types of packing elements such as random packing elements of nominal size 6 fabricated by EPC “Ingehim” can be utilized. On the outside, the column’s shell is equipped with an electric heater and is thermally insulated by two layers of the ceramic fibrous material called “Vladpromtex” and one layer of an aluminum foil. Temperature at the bottom and top of the column is controlled by using thermocouples 10 and 11. The column wall temperature is determined by thermocouple 12. All the thermocouples are linked to indicators OBEH, which are connected within a single network, containing a computer, by means of the industrial interface RS-485. All the measured data are collected and processed by the SCADA system Simplight that allows investigating dynamics of the distillation process. Depth of the vacuum achieved and the pressure drop through the packed layer are controlled by vacuum meters 13 and 14. For measuring the amount of distillate collection, measuring device 15 is used. Electric power of heating coil – 2 kW. Simple design, user friendliness and ease of use. Simple routine of experiments. EPC “Ingehim” also carries out studies on producing bitumen from very heavy crude oil for the purpose of designing pilot units. 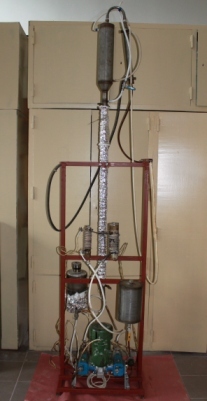 The lab-scale unit (see Fig. 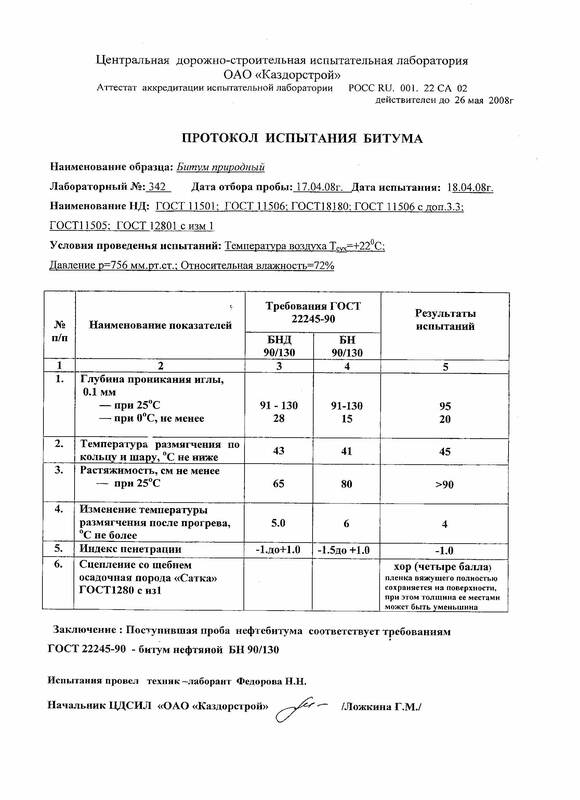 3) utilizes EPC “Ingehim” ‘s proprietary technology (Russian patent: No.2371468). The unit successfully passed tests in the Ashalchinskoe oil field (Almetyevsk, Russia) allowing to produce unoxidized bitumen of grade BND-90/130. 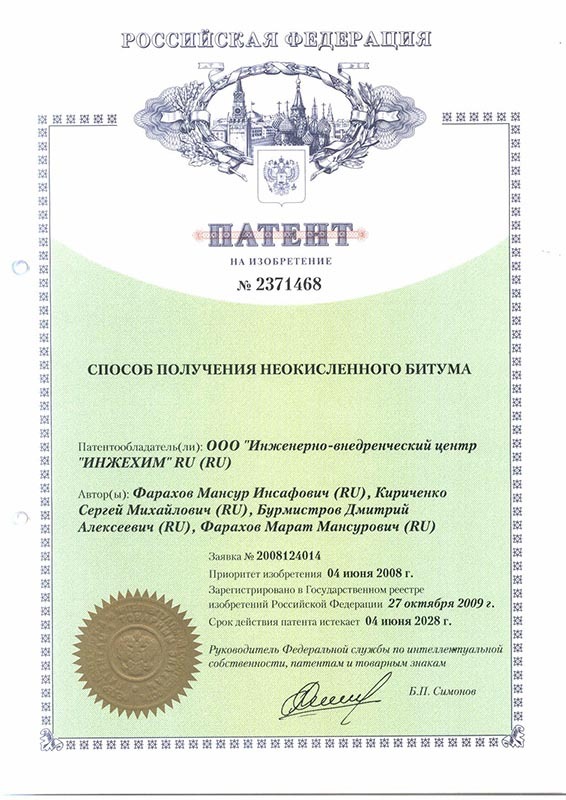 Quality certificate for bitumen is enclosed.